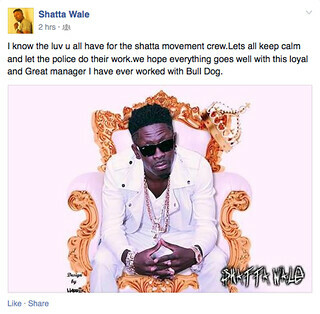 Dancehall artiste Shatta Wale is calling on his fans to remain calm as the Police interrogate his manager, Bulldog concerning the death of Kwaw Kese’s manager, Fennec Okyere. His manager, Lawrence Nana Asiama Hanson popularly known as Bulldog was picked up by the Police Criminal Investigation Department (CID) on Thursday in Kokomlemle, a suburb of Accra, as a prime suspect in the death of Fennec Okyere. Shatted posted the message below on his Facebook wall to counsel their numerous fans to keep calm and allow the Police to do their work. Shatta Wale calls for calm as Police interrogates his manager, Bulldog over Fennec Okyere’s death 0 out of 5 based on 0 ratings. 0 user reviews.